We greatly appreciate the BCFPA’s excellent impact on the industry here in BC, with their goal of helping the BC food industry achieve economic prosperity and sustainable safe production. And this isn’t just for big companies – the BCFPA represents micro, small, medium, and large processing companies and has grown to more than 550 member companies since 2004. When they reached out to Icicle Technologies CEO & President (and Icicle creator) Steven Burton to speak on the topics of traceability and technology, we are very happy to participate. Burton has previously written about traceability and Blockchain technology for Food Safety Tech Magazine, but this presentation specifically explored the challenges food businesses face when it comes to traceability, and how Icicle can not only resolve those issues but also enhance the overall production efficiency of food businesses. During the presentation, Burton explained that traceability is not just the problem of the Quality Assurance staff; everyone is responsible because traceability is a chain that should be interconnected. This is exactly what Icicle offers – the easiest way to manage traceability is not to do any work at all. Imagine having to manually record and document everything every time you swipe your credit card without banks automating them for you. That wouldn’t be very convenient, would it? 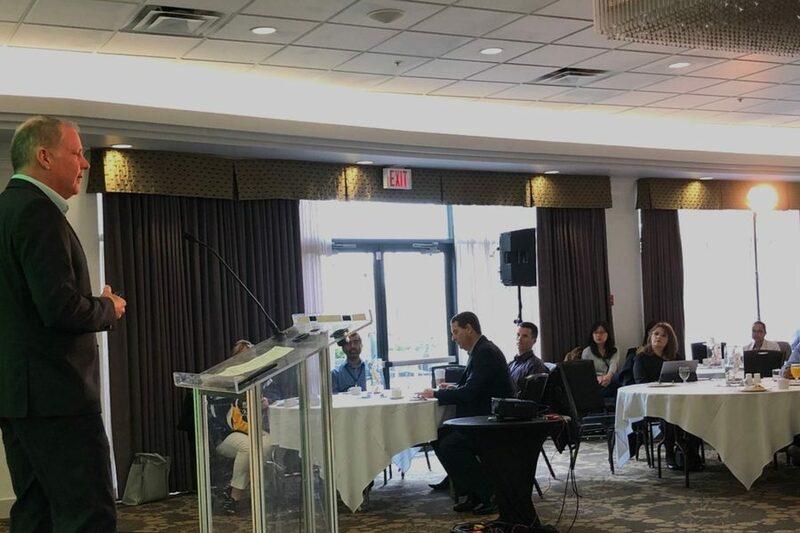 After enjoying a delicious breakfast provided by the BCFPA and the other sponsors of the breakfast (Syspro Canada, Phoenix Systems, SHEA Business Solutions, and Vision 33), we enjoyed some great conversations with food processors and other companies. We’d like to send a big thank you to the BCFPA for inviting us to such a wonderful event and tasty breakfast and another big thank you to all those who attended. Learn more about how Icicle can help automate traceability – and your entire food production operations – and request a free demo today! Steven Burton is a technology expert who, in addition to being the CEO and President of Icicle Technologies Inc., developed and continues to build Icicle, a comprehensive food production management platform offering the food industry creative and dynamic solutions for better production, better business, and better public health. Follow him on LinkedIn to hear more about the future of tech, or check out his articles in leading industry publications.